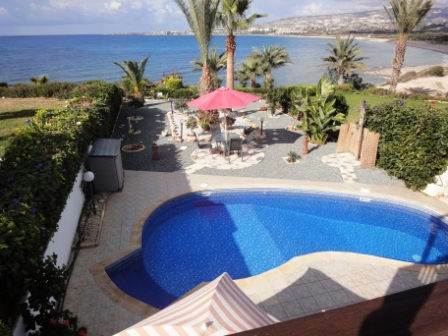 Kissonerga, Paphos - This immaculately presented bungalow is located in a prime sea front location overlooking the peninsula of Coral Bay and the site of the future marina. A few small steps lead down from the entrance hallway to the spacious L-shaped living room with comfortable lounge, dining area and corner kitchen. The kitchen is modern and well equipped with built-in oven, hob and extractor fan, fridge/freezer, dishwasher, and washing machine. There is access from here to the outside. The two double bedrooms are a good size, and have plenty of fitted wardrobes and storage space. The master bedroom also has an en-suite bathroom, and a separate shower room is located opposite the second bedroom. Both the lounge and master bedroom have patio doors providing easy access to the pool terrace and beautifully landscaped garden. A central patio area is an idyllic place to sit and take in the sea air, and listen to the waves lapping against the shore. The tiled roof terrace provides a more elevated view of the panoramic coastal and sea views, and the covered terrace, which can be further extended with the use of the sun awning, is a more shady spot. This property is truly something very special and offers a perfect setting in which to relax and unwind. It has been extensively refurbished by the current owners and is in excellent condition. Most of all it has location, location, location.